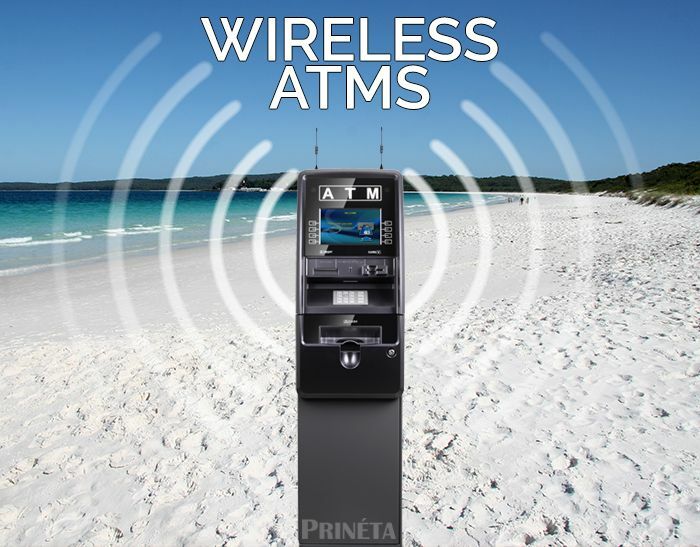 With Prineta’s wireless ATM network connection technology we can set up an ATM just about anywhere, from a booth at the farmer’s market, under a tent at a parking lot sale, or in a semi-permanent kiosk in the shopping mall or any kind of special event location. Anywhere there’s an electrical outlet available we can operate our ATM. Do you have the perfect spot to place an ATM in your business, but there’s no phone or internet line nearby to connect it with? If you have a location that isn’t yet wired properly for an ATM we can help. We regularly place ATMs with wireless connectivity in hotel lobbies, c-stores and many other locations, so you can put the ATM in that perfect spot, without all the hassle of re-wiring your location. We use the most sophisticated technology to connect our ATMs, harnessing the 3G/4G LTE data connection from cellular networks. We can connect the ATM to all of North America’s major carriers including Verizon Wireless, AT&T, Sprint and T-Mobile. Even if one particular mobile carrier in your area offers a spotty or unreliable cellular data connection, we can switch carriers until we find working connection. There is also another wireless option available in which the ATM is connected wirelessly via the location’s existing Wi-Fi. Since Wi-Fi is prone to brief outages that can prevent an ATM from completing a transaction we usually recommend the cellular network. If your ATM can’t process transactions reliably and without errors, then you might consider going wireless. A cellular data connection almost never goes offline, ensuring the same reliability as a hardwired connection. With a wireless connection you won’t ever have to worry about irritating your customers with an undependable connection. A wireless device can save hours of troubleshooting ATM communication errors. Another benefit with wireless service is it allows for increased data transfer speeds so transactions happen much quicker. If your customers are the ‘too-busy-to-wait’ type or you anticipate there might be a waiting line at your ATM at some point, a wireless connection could help. Re-Deploy ATMs to Different Locations. Do you have an establishment such as a convention center, stadium, or other event-venue where the ATM will need to be relocated depending on the situation? If so, wireless ATM communication is a must-have. 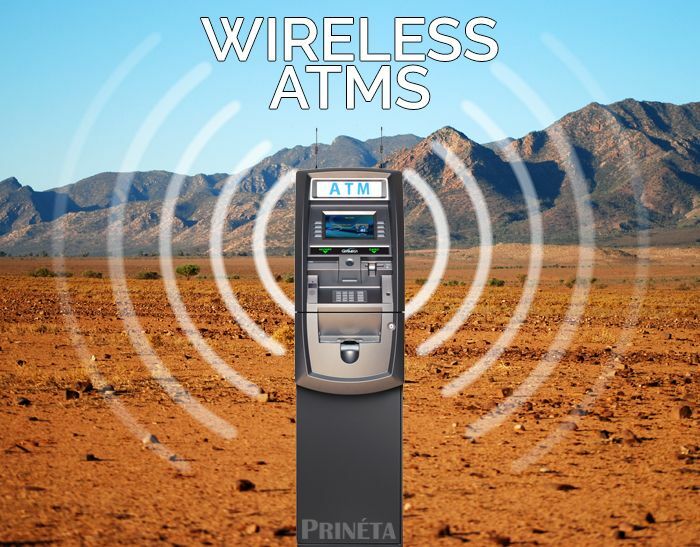 If you don’t already have an ATM at your location, Prineta offers a full-service wireless ATM placement: we supply the ATM, load the cash, process transactions and do everything related to the ATM. With this option we supply and manage all wireless connection hardware and operation fees at no cost to the merchant. We usually set up the wireless connection on the same day as the ATM is installed and programmed. 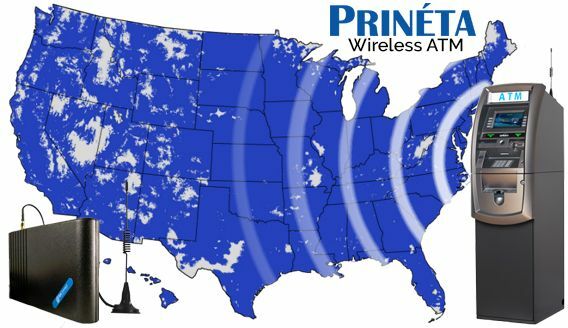 If you already have an ATM and are looking to switch processing, cash-loading, or management to Prineta, we can also offer free wireless ATM network connection services. If you’re interested in our full-service options, please contact us through the form below. A second option is available for merchants who already own and operate, or plan on operating, an ATM themselves. We will sell you the required wireless ATM connection hardware, ship it to you, and walk you through the entire setup and installation process. Getting your ATM set up with a wireless connection is a very simple process which only takes a few minutes. Our wireless devices are “plug and play”: simply connect the wireless modem to a power outlet, attach two antennas with magnetic bases to the top of the ATM and connect the ATM’s phone cord to the modem. Because it costs money to use a cellular network, just as it would on your cell phone, all wireless connections require the operator to pay a monthly fee while they’re being used. Our end-to-end service and support means that we will help you from the day you contact us through the duration of your service contract. If you’re interested in getting setup with wireless ATM connections, call us at 1-800-951-9533 and talk to us today.